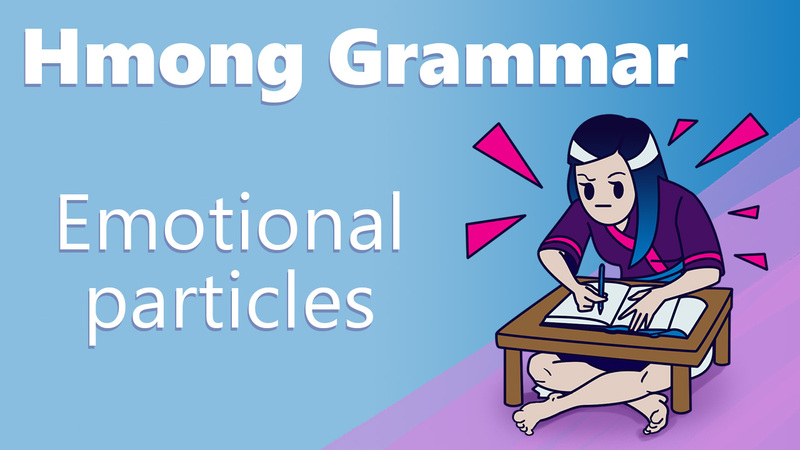 This is a video that describes the emotional particles or words used at the end of sentences and phrases in Hmong which express emotion rather than meaning. Sometimes they express a mix of both meaning with an implied emotion. The purpose of this video isn’t to give a list of all possible particles but to give an overview so you can understand how they work and more easily learn them over time. 2. Mog – turns a request into a polite request. 4. Diam! – That many? a. Npaum li ko diam?!? a. Yog thiab sub? – I think it’s right, isn’t it? b. Hnub no koj tuaj thiab pob – You are coming today, too, right? 6. Yuad – Used in a dare or when you want someone to accept. Peb mus yuad? Let’s go?